As seen on BBC1 and heard on BBC Radio 2, Radio 4, and local radio. Chris Middleton is one of the few private individuals (and the only journalists) in the UK to own a number of real humanoid robots, including Stanley Qubit, a next-gen NAO-25 machine made by Aldebaran Robotics. Scroll to the bottom of the page to see a video. 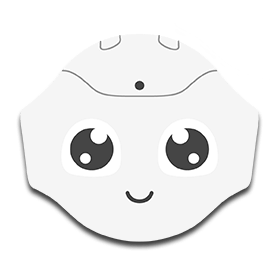 Like all NAO (pronounced ‘Now’) robots, Stanley Qubit is completely autonomous. He can walk, talk, answer questions, connect to the internet, sing, dance, recognise faces and objects, read the news, consult Wikipedia, answer emails, play soccer and golf, pick himself up off the floor, and much more. Applications are also available for use in education, including for children who are on the autism spectrum. In August 2015, Stanley co-hosted the BBC1 show Sunday Morning Live with Sian Williams, and appeared in a live TV debate, with musician and writer Ana Matronic and playwright Bonnie Greer. In February 2017, Stanley Qubit made history by becoming the first real robot ever to appear in a dramatisation of Isaac Asimov’s ‘I, Robot’ stories, on BBC Radio 4. The robot voiced several background characters in the week-long adaptation (a B7 production for Radio 4), alongside Chris, who also appears. 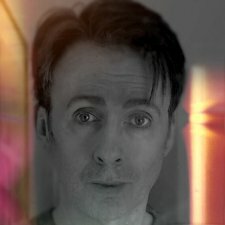 • Audio: Stanley Qubit interviews actor Nick Briggs about his role in the BBC radio production. • Audio: Stanley Qubit interviews scriptwriter Richard Kurti about Radio 4’s ‘I, Robot’. 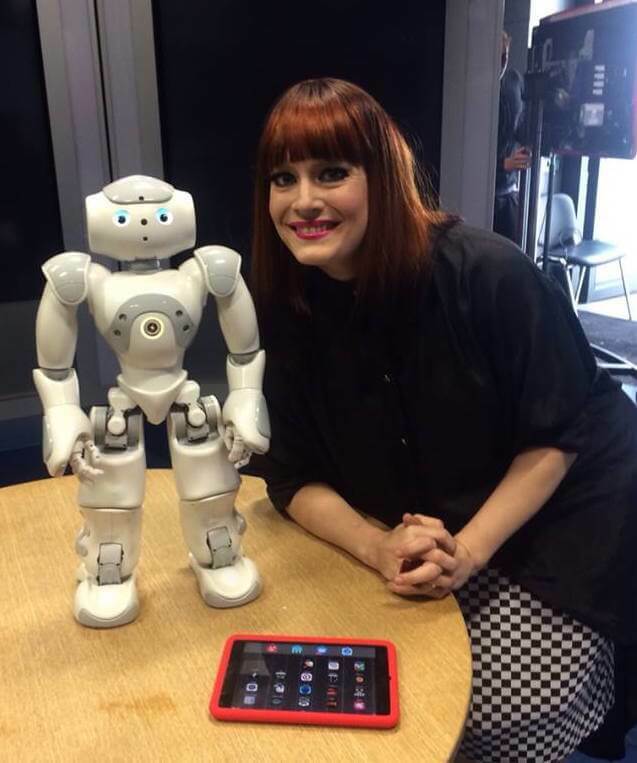 Stanley the robot, with Sian Williams on air. Stanley Qubit the NAO robot is available for hire via his own website at www.stanleyqubit.com. Chris can incorporate him into speeches on robotics, AI, and automation. Since 2015, Stanley Qubit has visited universities in England, Scotland, and Wales, taken morning assembly at several primary schools and spoken to sixth formers about the future, greeted delegates on stand at exhibitions and conferences, welcomed visitors to London museums, taken part in bespoke seminars for blue-chip companies, helped leading digital agencies imagine the future – and even opened a top London restaurant! Having Stanley Qubit on your stand guarantees visitors, attention, tweets, and social media shares, while at schools he can give pupils a memory to last a lifetime: the day a real robot stood up and said ‘Hello’. But Stanley is quite capable of introducing himself, as he does in the video, below. Like all NAO robots, he calls himself by his brand name. Prepare to be amazed. ‘Stanley Qubit’ is a NAO robot identified by unique distinguishing marks. As such, he is a character owned by Chris Middleton. More information at www.stanleyqubit.com.